(Santa Clara, CA: August 8, 2016) - Is your website AMP ready? Google announced on August 3rd, 2016 that AMP pages - https://www.ampproject.org/ - are available beyond the news carousel and in main search engine results pages. 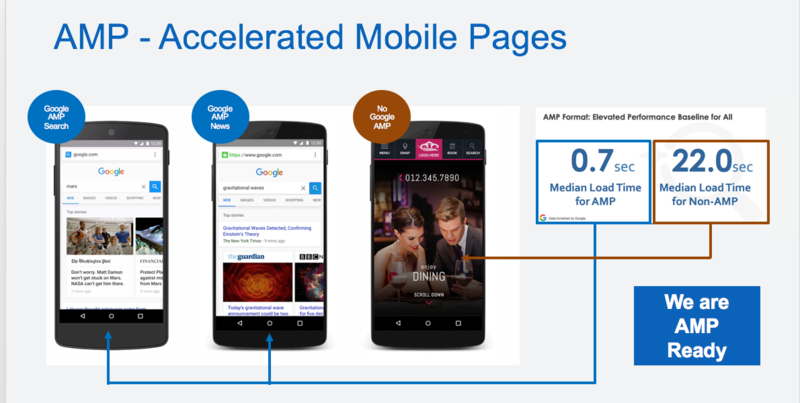 AMP (Accelerated Mobile Page) is Google's new format for rendering websites and content on mobile phones for faster speeds and download times for user enhanced experience. Google is getting 60% of their queries from Mobile devices and the speed of websites continues to be a big concern for mobile users. AMP websites renders15% to 85% faster than the standard HTML format, leading to rich consumer experience and hence better engagement and conversion. Studies have shown that a one second delay in page response results in 7% less conversions. Google had initially released the AMP format for news and media websites and just made the AMP format available on a demo site to enable developers for all websites to do further testing to create a lightning fast mobile user experience. You can view Google's blog post on AMP here. Please refer to our previous blog post for additional information. Milestone's GalexiTM CMS platform is ready to deliver a rich AMP experience to consumers. 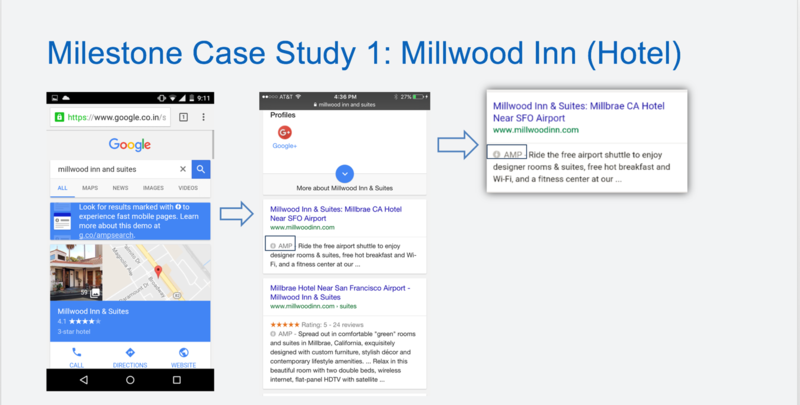 Milestone created an AMP version site for Millwood Inn San Francisco, and Google has given the AMP label to search results coming from AMP pages created for Millwood Inn. You can try out the AMP page experience on your mobile device by navigating to g.co/ampdemo. In the demo, search for Millwood Inn and you will be able to see how AMP can provide a faster user experience. The AMP site directly helps in creating a better user experience and engagement by decreasing page load times significantly. Contact Milestone today to ensure that your websites are AMP ready and are able to deliver the best user experience for your consumers. To get more information on Milestone products and services, contact us at [email protected] and (408) 492-9055, or explore www.milestoneinternet.com.